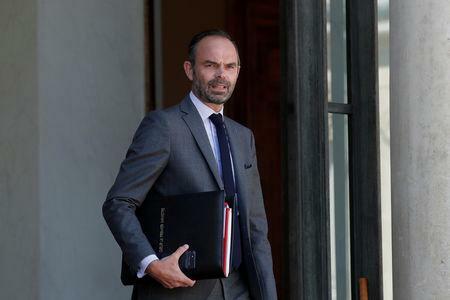 PARIS (Reuters) - French Prime Minister Edouard Philippe on Monday asked his ministers to prepare contingency measures in case of a no-deal Brexit. France hopes Britain will reach a deal with its European Union partners on its exit from the bloc but needs to be ready if not, Philippe's office said in a statement. In a government meeting convened to discuss this, Philippe "tasked ministers to prepare contingency measures that would be necessary ... to mitigate the difficulties linked with this unprecedented challenge", it said. Measures would include facilitating the stay of British citizens currently living in France and ensuring smooth border controls, the statement said. The government will ask parliament in the coming weeks to allow it to adopt them by decree. France will also need to take measures to take stock of Brexit even if there is a deal, the statement said, without giving details. President Emmanuel Macron said earlier on Monday that preserving EU unity was more important than forging a close relationship with post-Brexit Britain.